Welcome to Aspen Valley Karelian Bear Dogs. 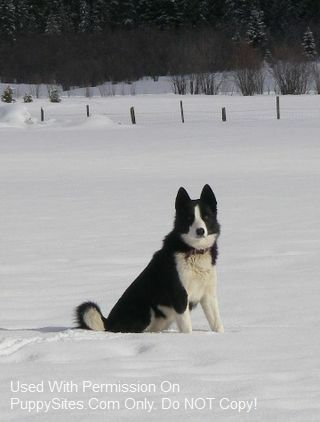 We specialize in uniting very special Karelian Bear Dog puppies with loving, responsible owners. We raise striking Black & White Karelian Bear Dog puppies that are born in a loving family which includes kids, cats, horses, and other dogs. They are high quality, well socialized, with excellent temperaments. They are a mid-sized dog, with great courage, stamina, and hunting instincts; used by the National Forest Service for protection. In the U.S., Karelian Bear Dogs are primarily used to protect their masters from predatory animals, such as cougars and bears, and will fight to their death to protect their master.